Kunis, Hahn and Bell are terrific together and Hahn shines as the epitome of a bad mom. When Bridesmaids hit theaters in 2011 it created a whole new level of female comedies. It was racier and raunchier and had audiences laughing hysterically. It opened the door to more crass and vulgar movies starring female leads in order to give male actors a run for their money. This summer, Bad Moms rivaled Bridesmaids with its all-star female cast and funny, yet inappropriate, script. Coming to Blu-ray and DVD this week, it is definitely one movie you will want to see over and over again. Amy is an overworked mom of two middle school kids. Her husband, as she will tell you, is often akin to her third child. She cooks, she cleans, she works, and she chauffeurs her kids around. When super perfect mom and head of the PTA, Gwedolyn (Christina Applegate; Anchorman) pushes her over the edge after a bad day, Amy quits then decides to run against Gwendolyn. Along the way, Amy is befriended by stay at home mom Kiki (Kristen Bell; House of Lies) and hard partying, floosy mom Carla (Kathryn Hahn; Transparent). While Gwendolyn plots Amy's downfall and sabotages Amy's daughter, the three ladies have a good time partying. Meanwhile, Amy and her husband decide to divorce, she loses her job and her kids hate her for basically "quitting" being their do it all mom. It all seems to fall apart, only to be neatly wrapped up in a bow at the end. With a cast like this, there isn't all that much that can go wrong. Kunis, Hahn and Bell are terrific together and Hahn shines as the epitome of a bad mom. Applegate is perfect as the rigid, backstabbing, Soccer mom we all love to hate. The supporting cast just serves to enhance the main characters, though JadaPinkett Smith (Gotham) is wasted as Gwendolyn's friend. A notable cameo by Wanda Sykes (Black-ish) adds a funny psychiatric moment as well. The Blu-ray is the standard 1080p High Definition video with a 2.39:1 aspect ratio. The color hues and clarity are what you would expect, so no big surprise there. The DTS-HD 7.1 audio is clear and sharp and highlights a pretty good soundtrack. Unfortunately, the mix suffers the same fate as so many other Blu-rays and I constantly had to adjust the volume between songs and dialogue, which I find quite annoying. The script has some laugh out loud moments and the cast delivers their lines with the ease of a professional comedian that makes sitting through the film a delight. Moms everywhere will also relate to so many of the everyday problems these ladies endure and I was, frankly, a little jealous that Amy "went on strike" (it seemed to work out so well for her that I'm considering trying it myself). I think some of the dads out there can relate too, and they should be encouraged to watch it as well – especially with the sequel Bad Dads supposedly in the works. The film beautifully blends real life with humor, topped with a great cast. While not quite as funny as Bridesmaids, it does the new "female" comedy genre proud. Download Bad Moms from the iTunes Store in Digial HD. 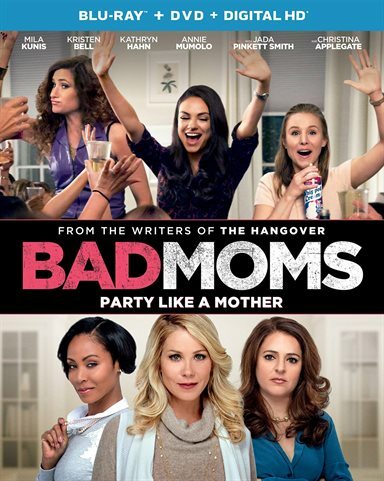 For more information about Bad Moms visit the FlickDirect Movie Database.